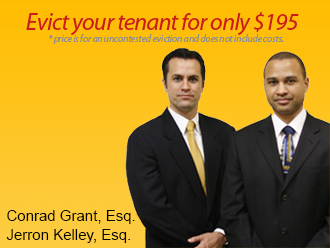 This information applies to an uncontested tenant eviction for possession only. Generally, an uncontested eviction can take 4 to 5 weeks to complete. Depending on the circumstances of your case, this period may be longer or shorter. 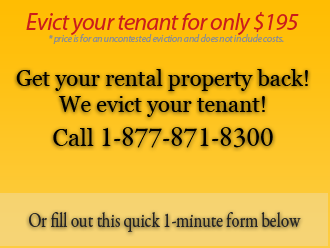 Upon retaining us for your eviction, we will send you a Three-Day Notice and helpful checklist at no extra cost. A fee of $80 will be charged if you would like the Firm to draft and serve a Three Day Notice or Fifteen Day Notice on your tenant. If you choose to sue for back-rent or damage to the Premises, please contact us to discuss fees and costs. If this becomes a Contested Eviction Process, applicable Attorney Fees and other costs will apply. In the event that the Tenant pays or leaves within the three-day or seven-day notice period, prior to the filing of the case with the Court, then the entire amount of attorney fees is refundable less $115.00 for pre-suit legal advice. Any incurred costs for preparation and service of the three-day or seven-day notice are non-refundable.